See larger version of architectural plans. "$17,130 Sought for Completion of Building Approved," Aug. 30, 1939. "Site Selected for Music Hall on Western Campus," April 25, 1937. "Western Music Building Renovation is Completed," Aug. 31, 1958. 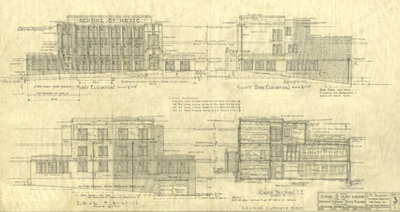 "Work on Music Hall on Western Campus to be Started Soon," April 19, 1937.